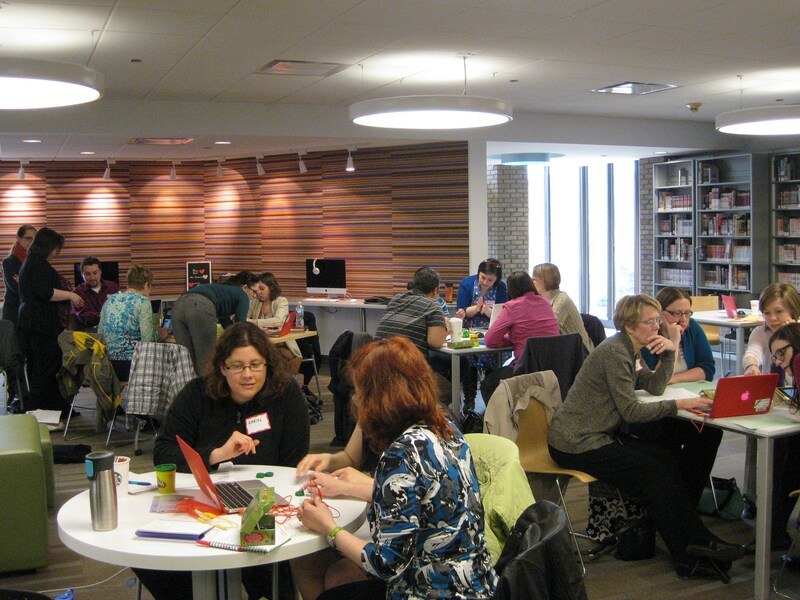 The Chicago area is lucky to have the fabulous Tinker Group, a group for “library folks who work with kids, teens, and technology.” Every other month, about 40 people gather to learn about technology programs and ideas from other librarians. It’s a great way to hear about new ideas and talk with others who have tried different and interesting programs. Each meeting usually focuses on a couple topics; there’s a brief introduction and then time for hands-on exploration. This month the topics were Scratch and Makey Makeys. Janet from the Wilmette Public Library talked about the Scratch programs she has been doing for five years(!). Scratch is a free programming language for beginners that can be used to create stories, games, artwork, and more. There’s a great video on the Scratch website that gives an overview of what it can be used to do. At Wilmette, 5th-8th graders come for 2-hour programs (unless it’s a more complicated project; then they’ll do multiple sessions). Everyone starts on the same project together, but they are open-ended so once kids have the hang of it they can continue tinkering and make it their own. They’ve had kids create a labyrinth (related to the Percy Jackson books), make a cheese touch game (for the Wimpy Kid books), make Mad Libs, and more. You can see some of their past projects here. They’ve also done open studio time where kids work on their own projects and help one another. You can use Scratch on PCs or Macs and it can be used in a browser or downloaded to your computer. The Scratch website has a great Help page with a getting started guide, beginning project ideas and video tutorials. To save projects, you need an account. Sometimes the kids have their own accounts, but it’s a good idea to create a library account that kids can use to upload their projects. Renee from the Evanston Public Library then presented on Makey Makeys. They are microcontrollers that you can use in endless ways—be sure to watch the video on their website to see some fun things you can do with them. The most basic way to use one is as a game controller; when you plug it into a computer it recognizes it as a keyboard and you can control the up, down, left, right, and space bar keys. Renee went over the basics of how to get a Makey Makey up and running as a controller and then everyone experimented with different ways to use it. A fun thing about Makey Makey is that it can be used with Scratch; kids can create a game and then use the Makey Makey to control it, or use their Makey Makeys with projects other kids have uploaded. I’ve actually done programs with Makey Makeys and they are a lot of fun! Liz Fraser is Children’s Librarian/Technology Coordinator at the Ela Area Public Library. Posted on April 16, 2014, in Literacy and tagged Liz Fraser, Tinker. Bookmark the permalink. 1 Comment.